With Father’s Day just around the corner you’re going to want to get organized and prepare something for the special man in your child’s life. Whether it be Dad, Grandad or Step-Dad, these crafts will make any man melt. Dads, just as much as moms, appreciate a handmade gift from a little one more than anything else. These crafts will allow your kids to make something great that Dad will cherish for years to come. Now let’s get started. This sweet button-up shirt and tie craft is too cute for words, but I’m going to put words to it anyway, because that’s my job. Now, you may notice that this craft comes from the one and only Martha Stewart. With skill like hers how can we be expected to recreate such a high-end gift? Don’t worry, I checked it out, and this craft idea merely requires some fancy paper and a few particularly placed folds. I tested it on one of my Kindergarteners and well...okay, maybe this one might be best for older kids. If you’ve got older kids that like a challenge, this is the Father’s Day craft for you. I surprised even myself when I added a handprint craft to the list. As the mom of two small children and a teacher of Kindergarten I’ve been pretty clear that handprint crafts need to disappear for a generation or two. It’s not that they weren’t, at one time, a great idea, but you truly can have too much of a ‘good thing’. And then, I came across this adorable handprint baseball craft and I figured, just one more wouldn’t hurt. For those of us that have little money and even less time, this salt dough doorstop is really cute and actually useful. There should be no shortage of rocks and pebbles this time of year so send the kids out to collect what they need while you work on making the ever so simple salt dough. I might not choose this one for my youngest because I’m wary of anything that could be used as a weapon but it might work for you. This is a perfectly adorable and actually clever gift for Dad. The kids will have a blast using those usually out of reach permanent markers to decorate golf balls for Dad. He’ll be thrilled because he’ll be pretty unlikely to lose his golf balls on the course and every time he lines up a shot he’ll be thinking of what thoughtful children he has. I’ve saved the best for last. Sure, it’s going to be a little more work, but this beauty can hang up on your wall all year round. 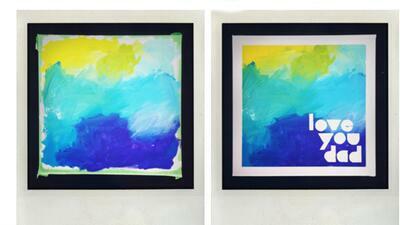 Grab some painters tape, a canvas or two and some tempera paint to get your little ones started. Dad won’t believe that his children can create art as fine as this. I’ll stop here because I have to hit the craft store. I can’t wait to get my girls started.